South Carolina seafood includes shrimp, blue crabs, clams, oysters, Spanish mackerel, king mackerel, bluefish, southern flounder, striped bass, croaker, speckled trout, weakfish, spot, wahoo, mahi mahi, groupers, snappers, amberjack, sea bass, and other fish. 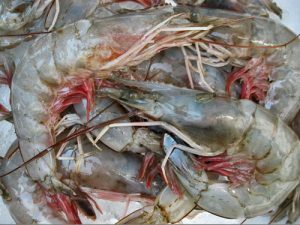 Shrimp is South Carolina’s most valuable species. Shrimpers harvest white and brown shrimp at various times of the fishing season. A highlight of South Carolina’s shrimp industry is the spring season when premium quality roe white shrimp become available.